Airbrush Face Painting - Are you ready to double your earnings? Sean will show you how with hyperdrive! This system can double the amount of people you can paint in an hour without sacrificing quality. No skill required! If you can hold a can of hairspray and a playing card in the other, you can paint up to 30 faces an hour. More people painted means more money. If that weren’t enough, think of these benefits: Having an airbrush setup means you can also provide temporary tattoos simultaneously, which expands your appeal to a much broader audience. You will always have something for the teenagers! Waterproof makeup that can last for days if desired, yet still cleans up easily with soap and water. You can use a separate air hose to inflate balloons. People like the smell….you will have to take the class to hear the rest of the amazing advantages to airbrush face painting. 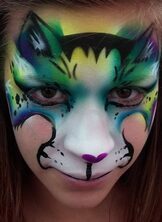 Hyper-Drive Airbrush Face Painting - the Fastest face painting, the shortest line and waterproof designs! That's Awesome. We are proud to introduce a new form of face painting we like to call "Hyper-Drive Face Painting". Some of you have seen this in action already. We use a different technique to greatly decrease the time it takes to paint each face. With Hyper-Drive Face Painting, an airbrush is used with pre-made stencils in simplified classic face paint designs. Water resistant makeup! The makeup we use is water resistant and amazingly robust. This is perfect for pool parties and water parks. Removes easily when you rub liquid soap on first, then rinse with water. The airbrush uses low psi and is very gentle. We have a large array of tattoos available for those who would rather have an arm or hand painted.